Baby, It Was Hot Outside! 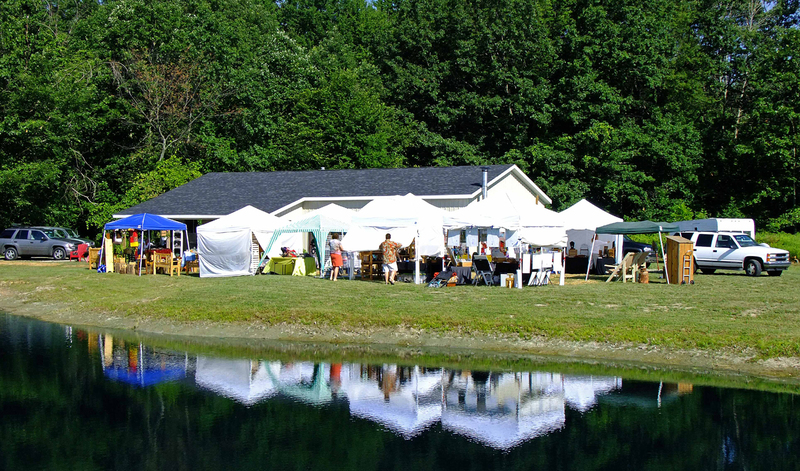 Artists setup around the pond and studio. The 1st Annual Summer Show and Art Fair was a big hit this past weekend! Thank you to all of the returning customers and it was great meeting new ones. Sales were good, all the RIO bowls sold except for one. And the new berry bowls were a hit. I will be redesigning the bowl so it has a taller foot and narrower bowl in a funky fluted shape. Pictures to come in a few weeks on the Sale page. The new glaze color “Mother In-law Blue” was a hot second best seller. The rutile base is soft with spatter additions of black, cream and more blue. A big thank you to the 14 artists that participated and to my neice, sister and friends who ran my sales table for me. And I can’t forget to thank my husband Brad and our daughter Hannah for handling traffic control and parking. At Red Mudd Studio we have a very long driveway, about 640′ of woods so sometimes its a little tricky with two cars are driving in and out at the same time. The weather was hotter than Haities, blue sky, gentle breeze and the pond looked almost good enough to swim in. 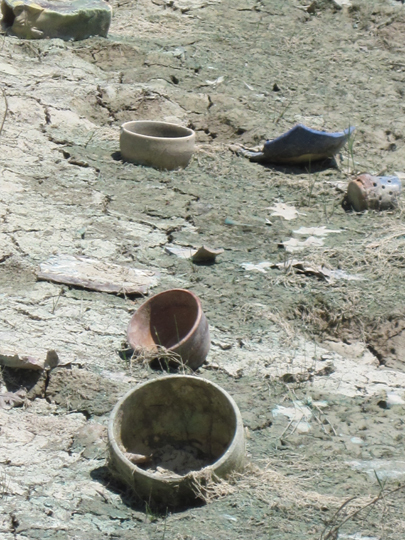 Except for the fact that Summer Camp displayed it’s ugly head of shurken shoreline filled with nasty pots! No need to step on a shard and cut your toe. Looking forward to heading back to the studio for upcoming classes and finishing my to do list before the next show. I will be in front of Whimmy’s Hamburger Place on Main Street in Lexington, MI, August 7 & 8. Stop by and say hello. Mention that you read the blog and pickup a free gift! 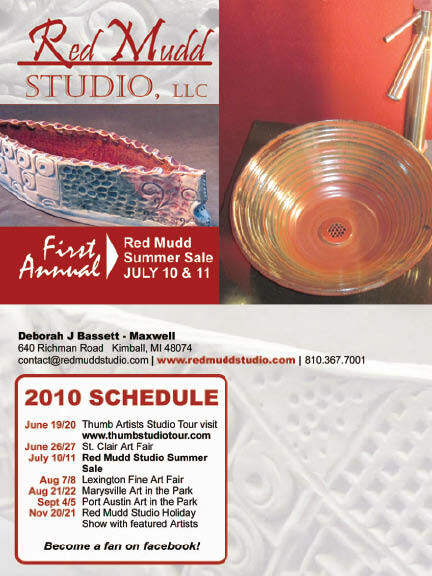 Over 15 artists will be at Red Mudd Studio, July 10 & 11, from 10 am to 5 pm. Raku and wheel demos, plus great art work to buy from Michigan artists. Enjoy Pottery, Photography, Fiber Arts, Jewelry, Stained Glass, Paper Cards and Wood Furniture! Red Mudd Studio is located approx. 6 miles west of Marysville and 13 miles southwest of Port Huron. If coming from the Detroit area, exit I-94 to Marysville, which is Gratiot. Turn left at first light, Range Road and head north 1 mile to next light at Smith Creek Road. Turn left and head west for 5 miles. Once you cross the RR tracks the next road is Richman and turn right and its the first driveway on your right. Over 20 acres, plenty of free parking. When I was a kid I went to summer camp and it was the high light of my summer vacation. When you think of Summer camp it means to go and then return. Like unruly kids, they get shipped off, shape up and eventually return home. Just like farm animals, when its their turn to no longer be the animal but the food on the table. Cows, pigs, chickens and others board a trailer and off to summer camp they go. They too, just like children return home, only they return in sections, packaged and frozen and sitting in the freezer. Well, at Red Mudd Studio, seconds, bad and or ugly pots go to summer camp. They too return to my horror! 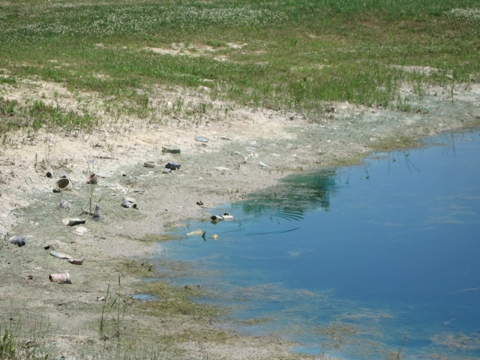 Its been so dry that the pond has shrunk about 4′ to 5′ around the edge. Mind you, I have been using the pond for summer camp for over five years and the water has not receded that much. Friends and customers love to walk the edge and find treasures. I’m absolutely mortified when they find piece and want to actually buy it. I need to work on my throwing arm. 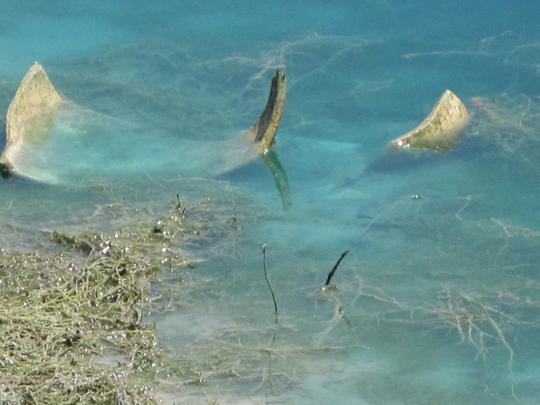 I’ve learned to toss the pieces directly into the center of the pond where its 14′ deep!